Arima Onsen in Kobe is Japan's most ancient hot spring resort town, thought to be founded over 1,000 years ago. In this guide, we'll introduce how to get here, the best hot springs, cafes, and other ways to enjoy this area. Arima Onsen in Hyogo Prefecture is said to be the oldest onsen (hot springs) town in Japan, with a history that dates back more than 1,000 years. While the area is small, extending out about a kilometer from the actual resort area, there are a number of hot spring inns and shops in Arima. The hilly main street known as Yumotozaka is lined on both sides with souvenir shops and other stores. If you explore the alleyways from the side you will also find many hidden gems, too. The appeal of Arima Onsen is the number of special hot springs here. There are also winding hill roads that overlap across the hot spring town. No matter how many times you visit, you’ll always find somewhere new. Arima Onsen has great access from anywhere within Kansai, including Osaka and Kyoto. You can enjoy a day trip there, but you can fully experience the charms of Arima if you stay one or two nights. We’ll go in-depth about Arima Onsen, covering day trips, cafe visits, and shopping! 1. How to Get to Arima Onsen - Direct Buses from Osaka and Kyoto! To get to Arima Onsen, we recommend taking a highway bus. There is direct access from Osaka, Kyoto, Kobe and Universal Studios Japan via either the Hankyu or JR bus services. They are have similar prices and take about the same time to get to Arima Onsen. Please note that JR is the only operator available if you’re leaving from Kobe Sannomiya or Universal Studios Japan. You need a reservation to secure a seat on the bus, so reserve from the sites below. If there are open seats, you can get a ticket on the same day of departure. In addition, you can get an early-bird discount on the JR highway bus for making a reservation at least one week in advance. There is a Hankyu bus stop next to the town entrance, with a waiting room on the second floor. The JR highway bus stop is near the Kobe Electric Railway Arima Onsen Station, up to five minutes away from the town on foot. The Kobe Electric Railway Arima Onsen Station is the closest station if you’re going via train. From Shin-Osaka Station, you’ll need to make three transfers (75 minutes, 1,480 yen). Get on the JR Kobe Line and get off at Sannomiya Station. From there, transfer to the municipal subway and get on the Seishin-Yamate Line, bound for Tanigami. On the municipal subway, get off at Tanigami Station and switch to the Kobe Electric Railway, then board the Arima Line bound for Sanda. Get off at Arimaguchi and switch to a train bound for Arima Onsen. Arima Onsen Station is the last stop. The route is a little complicated, so we recommend that first-time visitors take the bus. Arima Onsen’s major springs can be divided into two categories: golden springs (kinsen) and silver springs (ginsen). These are Arima Onsen’s famous golden springs, known for their reddish-brown hue. While the water running from the source is clear, because of its high iron content, it oxidizes and changes color when it comes in contact with the air. The water is said to help improve ailments like hypersensitivity to cold and back pain, as well as muscle and joint aches. In addition, due of the high concentration of salt, it helps the body retain heat, and is thought to be good for burns, cuts and skin problems. There are two varieties of clear silver springs: carbonated springs, rich in carbonated acid, and radon springs, which contain radium. Take a dip in the carbonated spring and your blood circulation will improve. You can expect some lowered hypertension. Drinking carbonated water stimulates the secretion of gastric juices in your stomach, so it is beneficial for increasing appetite. The radium contained in the steam of the radon spring is thought to activate and raise your immunity. The radon spring is also recognized for helping with gout, rheumatism, menopausal disorders, and other medical issues. Let's go for a soak at Arima Onsen! With plenty of lodgings with onsens, you can enjoy a night’s stay, but the town also offers many day trip onsen options. Here are three spots we recommend if you want to do a day trip. Kin no Yu, at the entrance to the town, is a public bath facility iconic to Arima Onsen. Admission for adults a reasonable 650 yen (with tax) and 340 yen for elementary school-age children. Walk five minutes and you can enjoy silver springs at Kin no Yu’s sister establishment, Gin no Yu. There is a combined pass which lets you use both facilities, which we highly recommend taking advantage of! There is also a free foot bath next door. You need to climb uphill to get to Kanpo no Yado Arima , a hot springs said to have the highest-quality spring water in Arima Onsen. You can enjoy soaking in water pumped from underground at the facility. This onsen is also located close to the ropeway that goes to Mt. Rokko. We suggest dropping in to refresh yourself after sightseeing on the mountain. Founded in 1191, Goshoboh has the longest history of any traditional inn within Arima Onsen, with elaborate details and an elegant environment. The open-air bath is unusual, as it is a mixed bathing system. However, the golden springs are opaque in color and conceal your body, so you’ll be fine as long as you’re sitting down. For more information about these day trip destinations, check the following article. 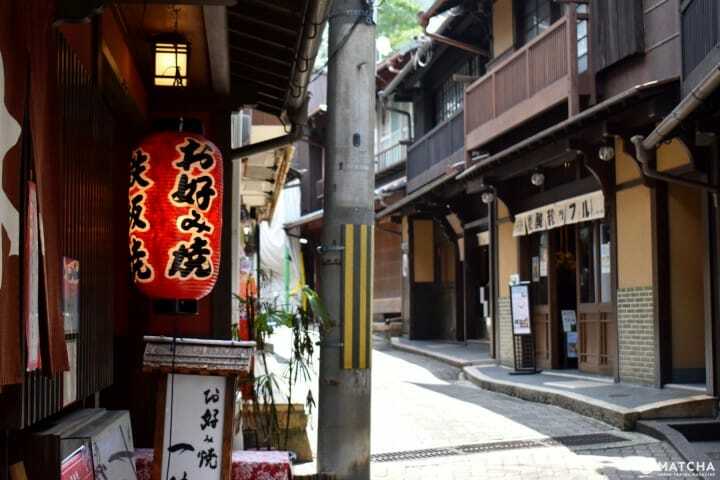 Arima Onsen is the perfect place to enjoy a leisurely walk. Yumotozaka is the narrow main street of Arima, but if you take a detour through its side streets, you will find hidden shops and lush green mountain roads. Make sure to come wearing comfortable shoes to enjoy walking around. We recommend stopping by the following places on your walk. There are several hot spring sources in Arima where the water wells up from underground. Here you can see the Gosho spring, where the golden spring water comes from. This is source for carbonated spring water. When you turn the faucet to the side, carbonated water will flow out! Carbonated water is thought to stimulate the secretion of gastric juices and improve appetite. Take a sip and you will taste weak carbonation and a strong salty flavor. In the past, people apparently used to add sugar to the water and drink it as cider. Tosen Shrine, pictured here, is surrounded by lush greenery. The shrine venerates the gods Onamuchi no Mikoto and Sukunahikona no Mikoto, who were said to have discovered Arima Onsen. According to legend, the gods spotted a crow that was healing its wounds by bathing in the reddish water, and found Arima Onsen. This may have been the site of the golden springs. It is said that if a woman takes a bath in Arima Onsen and prays at Tosen Shine, she will be blessed with child. The road next to the temple connects to Atagoyama Park, where you can enjoy a mountain stroll. The Arima Toys and Automata Museum was opened by a former designer from Glico, the major Japanese sweets manufacturer. The museum has 4,000 toys in its collection. Here you can not only see rare toys from all over the world, but you can actually touch and play with them. There is a train diorama that on the third floor which is perfect for families with children. All of Arima Onsen’s cafes offer a comfortable atmosphere for customers to relax, and you’re sure to forget what time it is. We’d like to recommend the following two cafes in particular. The cafe Tchic Tac is known for its delicious food. Popular items include the omelet rice (pictured), made with highly nutritious eggs, and curry made with Chinese herbs. Savor your meal with coffee from the Kobe brand, Hagihara, or with the local drink, Arima cider. Brightly lit and surrounded by bright green, Café De Beau has a stunning exterior. Here you can enjoy original Arima Onsen sweets. We recommend items such as the Arima roll, made using salt from the golden springs, as well as the tarts and pudding made using high-quality black soybeans from the city of Tamba. These desserts are all displayed in a showcase so you can find something to your liking. Pair your choice with a cup of original black tea and you can relax with an elegant tea break. Many people who visit Arima Onsen eat at the hotel where they’re staying at, so a lot of area stores close early in the evening. Due to this, there are many places to eat lunch. Sudachi soba (*1) is a popular choice at Dosanjin in Arima, which ordinarily has a line of diners waiting for the noodles. Located nearby, Dosanjin Hanare exclusively offers course meals. At Arima 18-ban, you can eat fresh shirasu (young sardines) with rice, and the local Hyogo specialty, Akashiyaki. For a change of pace, we also recommend the curry udon spot misono. *1: The juice of the sudachi, a Japanese citrus from Tokushima prefecture, has a refreshing flavor and is used to season hot pot dishes and fish. Sudachi soba is served with a plentiful topping of sudachi slices. A popular item to eat while walking around town is the minced meat cutlet from the Takenaka meat shop. Made of 100％ Kuroge Wagyu beef, one of these decadent cutlets is 250 yen (with tax). The ice cream shop Stagione, with its homemade gelato, has an array of 18 flavors, like seasonal fruit and Arima cider, made using Mt. Rokko dairy farm milk as a base. Pictured above is a double scoop of the Rokko premium milk and Kyoto Uji green tea flavors, topped with Arima’s special rice crackers made with carbonated water (480 yen for a double, 30 yen for the topping). Both flavors are rich, and the rice crackers add a refreshingly mild sweetness. If you want to enjoy adult beverages in Arima, we recommend going to the standing bar Sake Ichiba, directly operated by a local sake producer. Here you can drink original Arima beer and sake. A popular drink is Arima beer, made with water from a subterranean Mt. Rokko stream and Yamada-nishiki rice, considered to be the best type of rice for brewing sake. In addition, you can try fresh sake (*2) straight from the brewery. *2: Fresh sake (genshu) is freshly-fermented sake that has not been diluted with water. Though sake is usually diluted with water to control the alcohol content, genshu is very potent because of its concentrated nature, and it has a similarly strong taste. Sake Ichiban has plenty of snacks that go well with alcohol as well. The addictively delicious sujikon, shown above, is beef tendon and konnyaku (a jelly-like food), stir-fried with garlic, seasoned with ponzu sauce. In addition to Sake Ichiba, the Japanese sake bar Cinq Bar du SAKE opened in 2018, and the number of establishments is growing. The classic souvenir for visitors to Arima Onsen is a packet of carbonated rice crackers! While the crackers have "carbonated" in their name, they don’t feel fizzy when you eat them. Made with the carbonated water from Arima springs, they have a light, crisp texture and a mild sweetness. You can buy carbonated rice crackers at various stores in Arima. The rice crackers from the shop Mitsumori are popular, and have cute and colorful packaging. The crackers are inside a can, you don’t have to worry about them breaking. The crackers at each shop have their own subtle taste differences. You can taste test the different crackers so you can find your favorite flavor. While there are many souvenir shops in Arima Onsen, Yoshitakaya has a selection of Arima Onsen-only items that are unique and only for sale here. You can find bath accessories that allow you to enjoy the golden springs in your own bathtub. Other products include soap made using spring water, soft, jelly-textured face wash, and other exclusive cosmetic items. Yoshitakaya also has a many cute accessories and gifts. As you enjoy browsing the store, you’ll lose track of time before you know it! Head Off to Arima Onsen! Arima Onsen is close to Osaka and Kyoto and offers new things to discover with every visit. Be sure to enjoy the unique hot springs and the worthwhile adventures you can experience in town! This is a rewritten version of the article published on February 24th, 2017. 5 Recommended Onsen From Osaka Or Kyoto For A Day Trip! 2 Day Kobe Trip - Real Kobe Beef, Harbor Views, And Hot Springs!